As our schedule didn’t allow for participating in the scheduled Sunday activities after the Miles of Possibilities Conference, my dearest friend and I left Edwardsville bright and early that morning and headed north to explore a bit of Route 66 in the land of Lincoln. Initially the plan was to travel as far as the eastern terminus in Chicago, but as I was to meet a Norwegian tour group in Arizona on Friday, and needed be in Jefferson City, Missouri on Monday evening, it was impossible to travel further than Wilmington. We had a delightful time, made some great discoveries, visited with friends and acquaintances, met fascinating people, and enjoyed delicious meals. However, as with so many Route 66 travelers, we missed the hidden gems and overlooked treasures of Chicago. 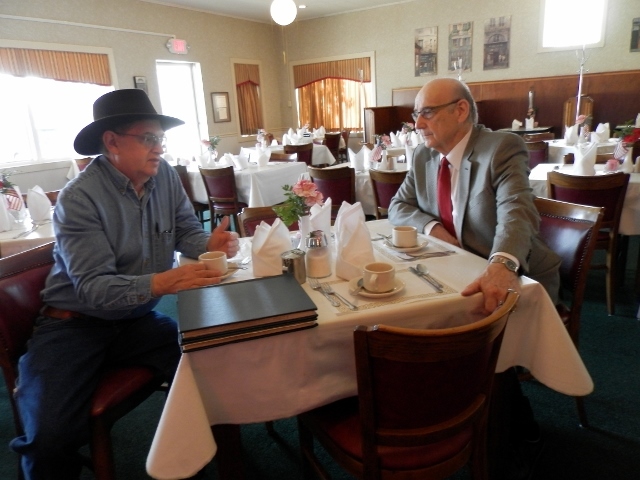 After photographing old segments of Route 66 framed by fall colors at sunrise around Edwardsville, we continued north, made a stop at the Rabbit Ranch to see Rich Henry, and then stopped at the Ariston Cafe to have coffee and visit with Nick Adams. This set the stage for the rest of the day; pop in and out of the car taking photos, visit a bit, drive, and stop to take more photos. In short, it was a most enjoyable day. A highlight of the day had to be our stop in Elkhart. The historic district that consists of about one block of century old brick buildings just across the tracks from Route 66 should not be overlooked. 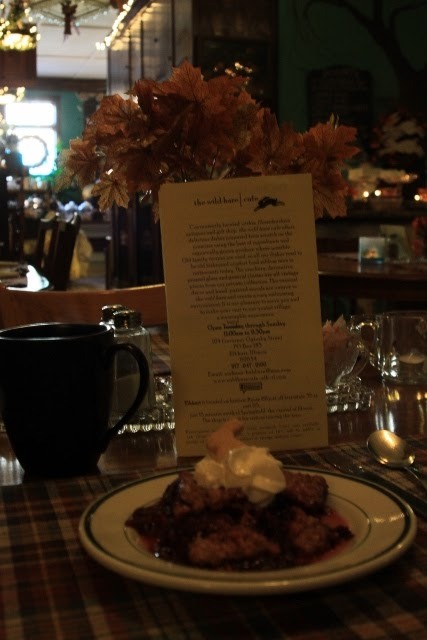 If for no other reason than an opportunity to enjoy a dinner or desert at the Wild Hare Cafe you should make this a destination. Housed in an historic bank building, the cafe itself is nestled at the rear of the building which means you must first negotiate your way through an eclectic antique store, past the displays of jars of fresh jams, jellies, and similar items, and a former walk in vault turned dining room complete with stunning wall mural. The little cafe is nothing short of charming. Mismatched vintage china set on antique tables adorned with linen table cloths and season specific centerpieces, quaint wall murals, and lots of darkly stained wood trim and shelving make for a rather pleasant ambiance. The smell of delicious foods and fresh baked pies stimulate the appetite. The menu offerings are basic, but as the owners use only locally grown produce, and the chef is rather talented, the food is superb. Prices are quite reasonable with most offerings being under $10. The owner is a local artist, Andrea, and her husband Peter Niehaus from the village of Maasgricht in the Netherlands who has a passion for woodworking. The towering shelves that serve as the portal to the restaurant were salvaged during the demolition of the old school in Lincoln, and restored by Peter. Accidentally I made another discovery across the street; a second hand store housed in a former cafe and soda fountain where all of the furnishings from at least a century ago are still in place. This includes the high backed oak booths, the marble counters, and a stunning oak back bar with beveled glass mirror, and leaded glass back lit posts that could very well be a Tiffany creation. We closed out the day at the Braidwood Motel in Braidwood, and with plans for breakfast the following morning in Wilmington before heading home via Jefferson City, Missouri. If your in need of basic but clean and reasonably priced lodging, I can highly recommend this motel. Before closing this out today, I wanted to highlight a comment received on a recent post and see if we could initiate some productive discussion. This note was received from the folks at Curious Traveler 66. Their blog is one that I follow. The frustration expressed in this note mirrors that from Route 66 business owners and enthusiasts in Amarillo, Tulsa, Los Angeles, and the major metropolitan areas along the Route 66 corridor. As I said to Scott Piotrowski during a recent Route 66 tour in Los Angeles, the cities are the most overlooked and least explored segments of this historic highway. Albuquerque may be the one exception but even in that city people cruise the Central Avenue corridor and overlook the earlier alignment on Fourth Street. And as overlooked as Chicago and Los Angeles are, in my opinion St. Louis receives even less attention. There are a multitude of reasons for this. For tours the urban congestion can create an array of issues that company owners prefer to avoid. Another issue is time. Our recent trip was a perfect example. First, we didn’t have enough time to even drive as far as Joiliet and second, there are so many things to see in the cities that it would be easy to consume an entire week or two. On a more personal note, I find all of Route 66 an endless source of fascination. However, I am most comfortable in towns like Elkhart, Atlanta, Spencer, Avila, or even Glenrio and Texola. So, what is the answer? My thoughts run like this; first, accept the fact that tour companies will most likely continue skipping large segments of urban areas. Next, work at the local level to generate awareness and spur development that creates the attraction. Then bite the lip and network to promote and market, and work to overcome preconceived ideas pertaining to (fill in the blank). Scott Piotrowski is doing this by introducing Los Angeles visitors to the light rail system, and by developing the festival. The need to generate interest in Route 66 at the local level, and the need to introduce the Route 66 enthusiast to overlooked treasures found along the urban corridor is one reason I am so supportive of Scott Piotrowski’s initiative to develop a 90th anniversary festival at the highways western terminus. Perhaps the folks in Chicago could organize a similar event two weeks prior. These events could serve as the anchor points for the rally being developed by Open Road Productions, or anyone else wanting to celebrate the 90th anniversary of the most famous highway in America with a cruise from end to end. BELATED MID LIFE CRISIS OR PURSUIT OF A CHILDHOOD DREAM? Obviously I have a horse in this race, but it's quite clear that the original purpose of Route 66 is lost on today's Mother Road travelers. When a highway path was selected with the intent of connecting the shipping ports of Chicago and Los Angeles, those major metropolitan areas were the intent, not a secondary thought. One could argue that rural America is the byproduct of 66 and today's travelers have flipped the agenda. Now, I'm not going to actually argue that side because it is foolish to say that any part of 66 is any more or less important to today's tourists. But that is exactly why we also need to start treating Chicago, St. Louis, and Los Angeles on equal Route 66 footing with Glenrio and Arcadia, OK. Doing anything less than that is doing a disservice to the history of the highway.